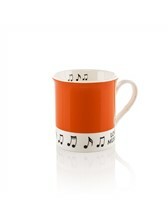 This cheerful Mug features a block of bright orange colour, adorned with a white treble clef emblem in the corner by the handle. With its bold, eye-catching design, the Little Snoring: Colour Block Mug is a perfect practical gift that will brighten up any music lover's day. This cheerful Mug features a block of bright orange colour, adorned with a white treble clef emblem in the corner by the handle. Musical notes inside the Mug and along the bottom edge add detail, and the words 'Love Music' are also displayed.